The current luggage argument appears to be ‘roller vs spinner’ among occasional holiday-makers, but Marmot has come up with something completely different for the discerning globe-trotter; a soft-top holdall that glides through airports, is super-tough, and fits on as a carry-on. Sized for cabins – 22 x 10.2 x 12.6 inches/56x26x32cm – and weighing 6lbs 10oz/3kg when empty, this toughly-made ‘hauler’ is great for, yes, hauling a load of kit from one country to another. Whether it’s clothes for a week, or a complete travel gear portfolio, this roller has plenty of pockets and a handy side-compartment at the top-end, too. The extendable handle is a God-send in airports and for wheeling luggage from car to hotel, and while this isn’t particularly suited to backpacking in the traditional sense, it’s definitely aimed at ex-backpackers who can’t stand the shiny plastic styling of modern luggage. The main compartment can take 40 litres of gear, but aside from a handy zip-round soft lid (which has a mesh pocket for toiletries on the inside), there’s also a zip-up ‘wet’ compartment stretching from end to end. That could be used for small items like underwear, though in our test we ignored it – it’s just too flimsy to be of much use if the bag is full, and gets in the way. At the upper end of the bag is another compartment that somehow also reaches under and into the main area, thus making it useful for putting items you just couldn’t squeeze into the main section, In there is a handy mesh pocket for storing tickets and documents, but it’s perfect for taking a book, Kindle or anything else you want quick access to as you board a plane, and before you stuff it in the overheads. 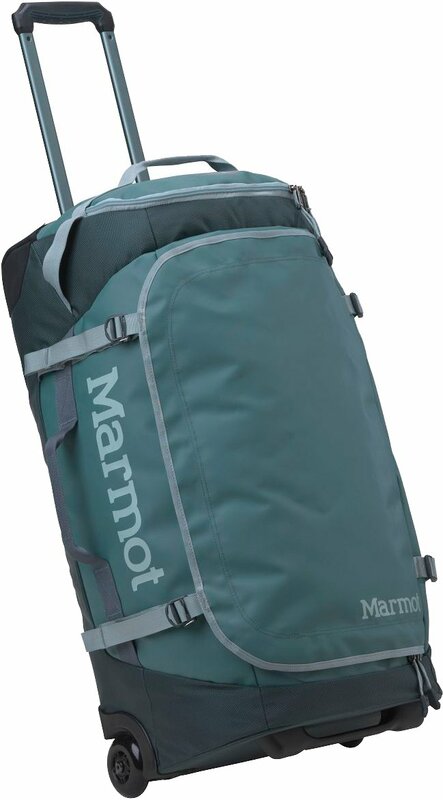 There’s nothing complex about the Marmot Rolling Hauler Carry On; it’s tough, it’s wheeled – and properly so (no heave, sway or surge while you walk) – and it maximises storage while retaining enough organisational pockets. Add that cabin-friendly size and we have a versatile, outdoorsy bag that’s perfect for fly-drives, car holidays and skiing.